Angela Slatter’s introduction to At the Edge speaks eloquently about both the fine craft and the hard labour needed to create good short stories. She should know – she’s one of Australia’s finest speculative storytellers, and I’m very much looking forward to reading her debut novel Vigil (which in turn is based on an excellent short story) as soon as I can. 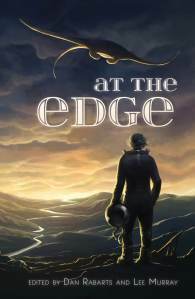 For the past few months, Angela has been hosting a series of interviews with the At the Edge authors. As of today mine went live. Check it out to learn what oddball corner of my head “Seven Excerpts from Season One” popped out of! My monthly newsletter features new fiction, new announcements and – er, other news. For exclusive content not available anywhere else on the internet (often with good reason), sign up here. This entry was posted in Announcements, Interview and tagged angela slatter, at the edge, interview, vigil. Bookmark the permalink.